Bay Trees Bay Laurel, best known as Sweet Bay is famouse for it’s leaves they are used as a culinary herb that makes a great addition to the kitchen garden and can easily be grown on a patio. 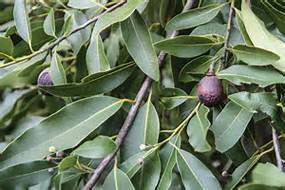 Bay tree plants are very attractive with their waxy-looking olive green leaves, branches that can be trained to suit your taste, and flavorful leaves that will serve a valuable function as a versatile kitchen spice. 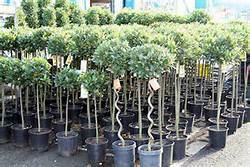 In its native Mediterranean climate Bay Laurel is an evergreen tree reaching heights of over forty feet. 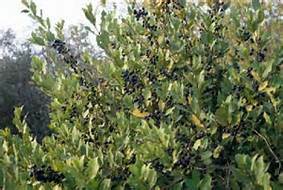 The Bay Tree is the source of several spices and is very popular in Mediterranean dishes. The leaves may be harvested at any time, but the flavour and fragrance is strongest before blooming. The leaves are used both dried and fresh depending on the type of cooking. Some people prefer to use dried leaves because the drying process removes several bitter tasting compounds. The aromatic leaves are often added to Italian pasta dishes, added to stews or to garnish lamb roasts. When using the leaves whole it is important to remove them before serving, since the edges can be sharp and abrasive. Ground bay leafs can be swallowed without risk, so many people prefer to use the leaf in this manner for soups, stocks and stews. It is also be used in the Bloody Mary drink. The whole leaves have a shelf life of one year. The dried laurel berries and pressed leaf oil may also be used as a robust spice. Bay Leaf Pure Essential oil 10ml. Supplied in an Amber Glass bottle with dropper & tamper evident cap.